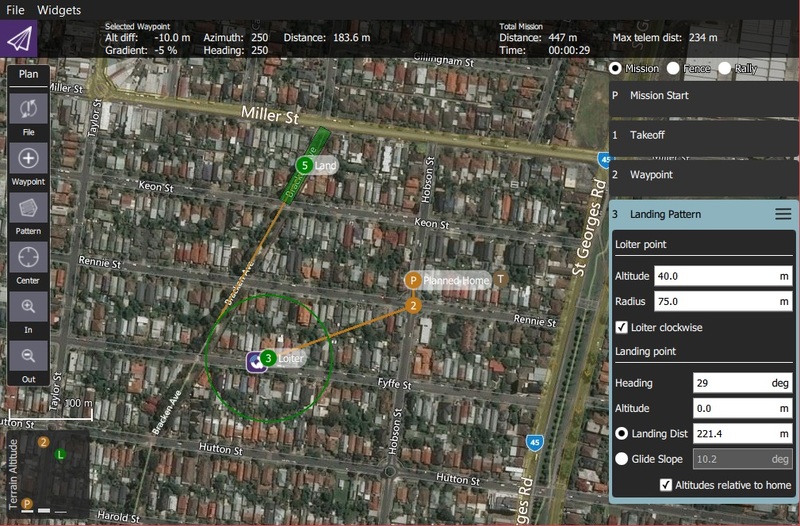 The Fixed Wing Landing Pattern tool allows you to add a fixed wing landing pattern to a mission. It is supported on both ArduPilot and PX4. The first point of the pattern is a loiter point with a specific altitude and the second is a landing point. The vehicle will loiter at the first point until it reaches the target altitude, and then begin the landing sequence to fly down to the specified landing spot. Both the loiter and land points can be dragged to new positions, and a number of other settings can be configured in the associated mission item. 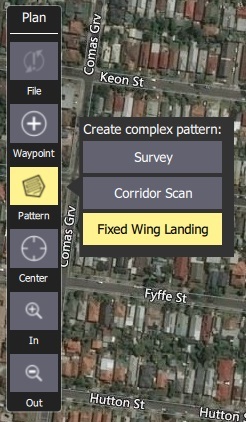 Choose the Pattern Tool from the Plan Tools and then select Fixed Wing Landing Pattern. This will add a Landing Pattern item to the mission list (on the right). Click on the map to create both the loiter and landing points. These can be moved on the map. Additional settings are covered in the next section. 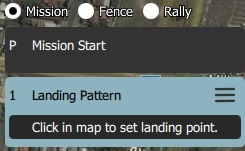 The landing pattern can be further configured in the associated mission item (in the mission item list on the right hand side of the Plan View). 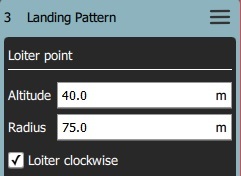 The Loiter Point settings are used to configure the loiter altitude, radius and direction. Loiter clockwise - Check to loiter in a clockwise direction (anti-clockwise is the default). The Landing Point settings are used to configure the landing position and path. Heading - Heading from loiter point to land point. Altitude - Altitude for landing point (nominally zero). Landing Dist - Distance between loiter and landing points. Glide Slope - Glide slope between loiter and landing points. 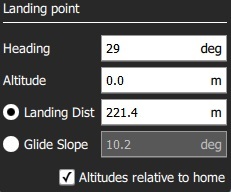 Altitudes relative to home - Check to set all altitudes in mission item to be relative to home (default is AMSL). DO_LAND_START - If you abort a landing it sends DO_GO_AROUND to the vehicle, which then causes the mission to return to this point and try to land again. The vehicle flares to landing using a flight path generated by the firmware between the NAV_LOITER_TO_ALT point and the NAV_LAND point. If those two locations violate the vehicle&apos;s flare constraints (e.g. descent angle is too steep) an error will be raised after you upload the invalid mission to the vehicle. On PX4, violating the flare constraints sends an error message to the ground station at upload time, and the autopilot will refuse to start the mission (since it fails integrity checks).